This is 9mm Remington Express 115gr. Jacketed Hollow Point Ammo. Remington's full-length jacket and hollow point construction provides good penetration with controlled expansion while assuring dependable function in autoloading pistols. This is the "green" box ammo that shooters have trusted for years. 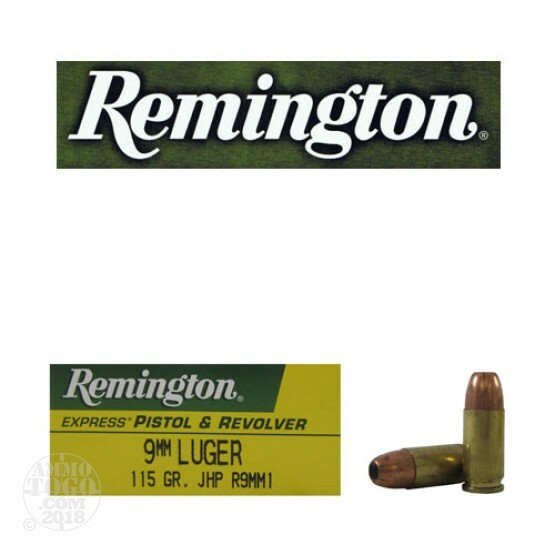 This ammunition is new production, non-corrosive, in boxer primed, reloadable brass cases. This ammo comes packed in 50rd. boxes. Muzzle Velocity: 1155 FPS.